A master poet and family man, a Nobel laureate and friend, a guest of royalty and farmer's son: Seamus Heaney had a life which was a smooth blend of the ordinary and extraordinary. Reaching the headiest heights of literary genius, the ever-modest everyman insisted his poetry was just part of a chain. "A written chain; we'll call it a human chain," he said when he gifted his manuscripts and notes to the National Library of Ireland. Heaney's glistening career won him global recognition and a place among Ireland's literary heroes like WB Yeats, Samuel Beckett, James Joyce and George Bernard Shaw. But talked about in the same company, the unassuming teacher from the 50-acre Mossbawn farm in Co Derry would liken himself to "a little foothill at the bottom of a mountain range". Both a major talent and a decent, down-to-earth individual, the affable Heaney could smoothly move from dining with the political elite to playful weekends at his Dublin home with his grandchildren. Born into a nation divided, some of his work was heavily influenced by The Troubles. Yet he never allowed his need to write about political violence to colour his patriotism. He was unapologetically Irish and despite his love for rural south Derry, boglands and "the north", he spent much of his life living in Dublin. Heaney's work often recalled the country backdrop of his youth. He was the eldest of nine, born into a farming family, to an over-loquacious mother and a labouring father who barely spoke a peep. At the age of 12, the young Heaney won a scholarship that saw him shake off his country-boy life and depart Mossbawn farm for good. He would describe this as a move from "the earth of farm labour to the heaven of education". He attended St Columb's College, then a Catholic boarding school in the city of Derry, where his evolution as an academic, teacher and poet began. In 1957 he made the move to Belfast where he studied at Queen's University. It was during his time in the city that he wrote his first collection, Death Of A Naturalist, in 1966. The premiere poem was Digging in which he showed a sense of regret having left behind the farm life that shaped his family. He recalled his father, and his father before him, sinking their spade into the gravelly ground, cutting turf and scattering new potatoes. He remembered the "cold smell of potato mould", "the squelch and slap of soggy peat", but lamented that he had no spade to follow those men. Instead, his tool was a "squat pen" that rested between his finger and thumb, "snug as a gun". His style was born. It was with a pen that he would do his digging. And so he did, around the world, garnering praise from royalty, the political elite and the academic greats. Heaney left Belfast in 1972 and moved to Dublin. But he spent many years travelling between Ireland and the US where he held a teaching post at Harvard University. His poetry beginnings coincided with his meeting with a woman who would become his wife: Marie Devlin. He regarded her as his muse, who influenced him both professionally and imaginatively, and appeared in a number of his poems. Together they had three children: Christopher, Michael and Catherine Ann. Grandchildren followed, whom Heaney doted upon dearly. Those who knew him personally talk about him as a regular Joe Soap, while Heaney maintained strong friendships with his contemporaries. In 1983 these were tested to the limit. He expressed his strong national identity in a fall-out with poets Andrew Motion and Blake Morrison who included him in what they called The Penguin Book of Contemporary British Poetry. Heaney's response, An Open Letter, a 198-line poem, left no doubt about his staunch nationalist identity. "Be advised, My passport's green. No glass of ours was ever raised, To toast the Queen," he wrote. Almost 30 years later, Heaney did in fact raise a glass to toast the Queen when he sat at the top table as she dined with a host of Irish figureheads during her historic visit to Ireland in 2011. 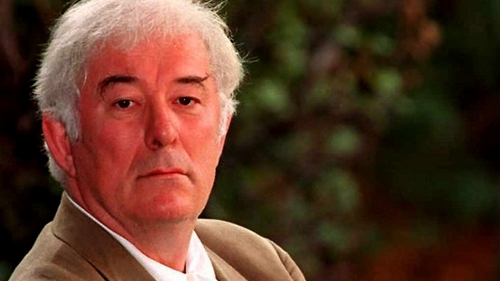 Heaney was awarded the Nobel Prize for Literature in 1995. The following year he received the Commandeur de L'Ordre des Arts et Lettres (Commander of the Order of Arts and Letters) from the French ministry of culture. Other accomplishments followed, which included honours from Trinity College Dublin last year when it named one of Ireland's most prestigious academic appointments after him: the Heaney Professorship in Irish Writing at Trinity College Dublin. Heaney was just as comfortable in the US as he was in Ireland, forging firm friendships with the likes of former president Bill Clinton who regarded him so highly that he quoted him regularly during major speeches. Mr Clinton chose a phrase from Heaney's play The Cure At Troy in a speech during a visit to Derry: "hope and history rhyme". A phrase he went on to use in his book that detailed his vision of the US in the 21st century. When Heaney handed over his manuscripts to the National Library two years ago - in what was one of the few final public appearances he made - he spoke of a "huge sense of gratitude and pride". He recalled his days studying, doodling and writing in that library, a place he regarded home to his literary heroes who paved the way before him. Addressing the Taoiseach, major academics and poetry lovers, he was almost oblivious to the fact he had become a hero himself.